First of all, consider the source and cynicism of these questions. 28 And it came to pass that the God of heaven looked upon the residue of the people, and he wept; and Enoch bore record of it, saying: How is it that the heavens weep, and shed forth their tears as the rain upon the mountains? 29 And Enoch said unto the Lord: How is it that thou canst weep, seeing thou art holy, and from all eternity to all eternity? 31 And thou hast taken Zion to thine own bosom, from all thy creations, from all eternity to all eternity; and naught but peace, justice, and truth is the habitation of thy throne; and mercy shall go before thy face and have no end; how is it thou canst weep? “Unto thy brethren have I said, and also given commandment, that they should love one another, and that they should choose me, their Father.” WOW! So how does this relate to today’s reading? Well, think about the situation that the Anti-Nephi-Lehies were in. 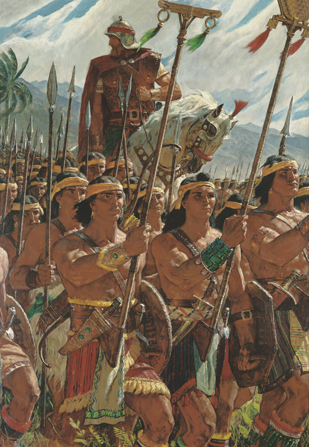 After the Anti-Nephi-Lehies made a covenant with God to never again take up weapons of war, the Amalekites and the Lamanites began to make preparations to go to battle against them. They had no one to turn to. They needed help. They were desperate. The only people that they could ask for help were the people that they had mistreated their whole lives–the Nephites. Ammon led the Anti-Nephi-Lehies to Zarahemla, where they received protection from the Nephites and became known as the people of Ammon. They were given the land of Jershon for their new home and promised protection by the Nephite armies. 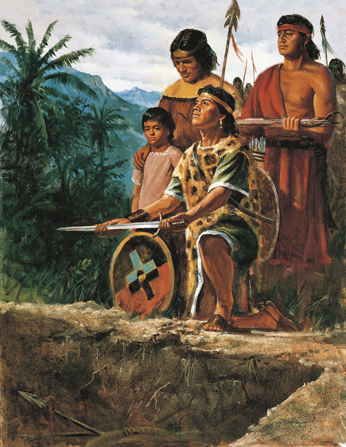 Alma the Younger and the Sons of Mosiah each exhibited the same kind of enthusiasm to become their “brother’s keeper” as they set off for their long and eventful missions to bring everyone to the gospel (see Alma 26 and 29). Remember when the Savior taught an important principle of the gospel in Matthew 25:31-46? 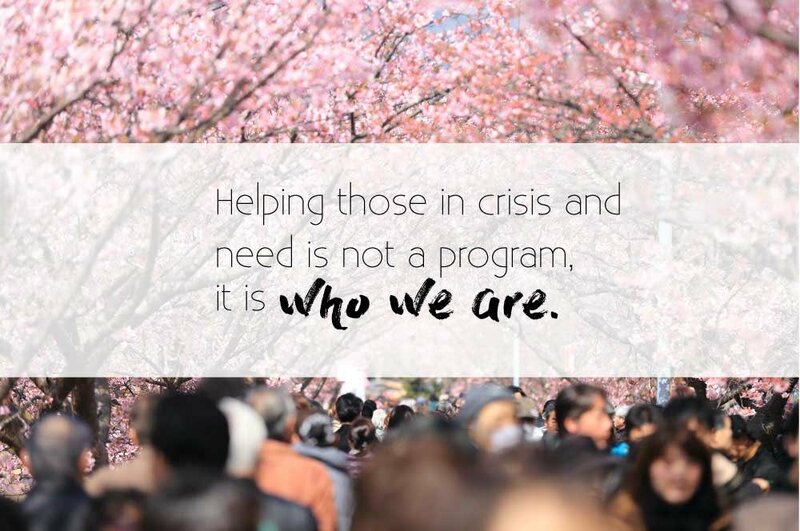 In the April, 2016 General Conference of the Church we were invited to be our “brother’s keeper” as part of the #IWasAStranger efforts of the Church. Here is a playlist that I created of the Church’s invitations and efforts to help us to help others. I believe it was around this time of year, when we commemorate the restoration of the Aaronic Priesthood, that I went on a “Father and Son” campout that taught me a difficult, but important lesson. I am the oldest of six children, so one-on-one time with a parent was a precious commodity. I was excited to be able to spend some time away from the rest of the family with just my dad. Luckily, I had a pretty good relationship with my dad. It was during a time that our family was also struggling financially. There wasn’t much money to go around and I was old enough to know what was going on (~12 years old). My mom had put together some food for us to enjoy. Nothing really special, but under the circumstances it was a little more special than “the usual”. To my surprise, my dad had invited another boy to come with us on this “Father and Son” outing. I didn’t ask why; I was a little too annoyed by it to want to bring it up and make a bigger deal about it. The boy was older and I can’t remember that I had ever met him before. He worked at the same place as my dad. When we got to the camp site, we got everything ready and started to break into the food. I noticed the other boy had a few boxes of “Peeps” that he had gotten out. I am not a fan of Peeps, so I thought that was a strange thing to bring for a night of fun. Then, I noticed that my dad kept giving him “our” food (He has always been a VERY generous person–even when lacking.). I tried to let it go, but I was a pretty immature and selfish kid. I don’t remember if I said something to my dad in front of the boy or if I waited for a more private and opportune moment, but when I had the chance I kinda gave it to my dad and asked why he was giving away all of “our” good food. He didn’t get upset, but he was probably pretty disappointed–if he was disappointed he didn’t let me know it. Instead he calmly explained to me that he was sharing with the boy because all the boy had to eat for the entire campout was those couple boxes of Peeps. I think the next thing I did was say something to my dad about how the boy should have known better and that he needed to face the consequences of his lack of preparation (that is the oldest of six speaking). Now here is where it got painful. Not because my dad hauled-off and hit me or something, but because of what he said next. He told me that the boy’s dad had recently died and that he didn’t have anything else in his home that he could have brought to eat during the campout. Oh boy… oh, boy… I don’t know if I have ever felt such guilt in my life. My heart sank. My conscience began to show me what a jerk I had been. I wanted to cry, not just because I realized how bad I had been, but because I felt a great deal of sympathy at that moment. I honestly didn’t want to eat anything else all weekend (although I am sure I did). I learned a LOT of valuable lessons that day. One was about making a conscious effort to be “my brother’s keeper”. I obviously didn’t think about it in those terms at that age, but that was the message that sank into my heart. From that point on, it seemed like God would superimpose that boys face on the people in my life that needed a little extra help. I am sorry to say that I was not always as willing to jump in and help like I should have been. But I tried a lot harder, and I tried to withhold judgment a lot more often. Anytime that I think of that experience (like right now) I feel such regret for myself, and sorrow for that boy. I can’t remember his name, but I can’t seem to forget the face as he holds that box of Peeps before my mind’s eye. It was a tough lesson to learn, and perhaps God knew that it could never be taught–it had to be caught. I don’t know. But what I do know is that the lesson was learned and it is still being applied today. It is one of many lessons that the Lord has taught me about being my brother’s keeper. On another occasion God let me be the brother who needed to be “kept” by another. It was about two years after the “Peeps experience”, when a young ninth-grade boy showed me what it meant to be, “my brother’s keeper”. To him it was no big deal, but it was a BIG deal to me. His name is Deran Coe, and what he did made all the difference in the world for me. I had just moved from the coast of L.A. to a suburb of Pittsburgh (specifically, Center Township, in the middle of winter). Having been a “beach bum” from the west coast for the previous eight years, I dressed and spoke differently from everyone else at Center high school. My first morning at school was not too bad because the teachers would just assign me a seat, introduce me quickly to the class, and move on to teach their lesson. Then lunch time arrived… The worst thing about lunch for this “new kid on the block” (special reference for my wife), is that there were no assigned seats, and I didn’t want to take someone else’s “usual seat”, so I awkwardly searched for a seat that looked like it wouldn’t make my bad situation even worse. Well, it was a small high school (less than 150 students in my graduating class) and the ninth-graders ate in a separate room from the rest of the upper-class students. The best way for me to describe it is to say that it was a lot like a typical LDS cultural hall. It had a stage and a large multipurpose floor. If I remember it correctly, it was filled at lunchtime with about 35 picnic-type tables that could sit about 8 students each. I think it was 5 rows of 7 tables. There were only enough students to fill in the first 2-3 rows of tables. That meant that there was at least 1 entire row of tables between me and my new classmates. I just hung my head and tried to drown my embarrassment in my peanut butter and jelly sandwich. I hadn’t gotten too far into my lonely meal, when I heard a boy’s voice. I looked around a saw a smiling student. He introduced himself as Deran, and asked if I wanted to come and join him and his friends for lunch. The ironic thing is that there was no room at Deran’s table, so I ended up at the table next to his. That is when I first met the great guys that I would spend most of my high schools days with: Steve, Brett, Jeff, Ryan, Chris, and Aaron. Deran and I never really became the kind of friends that “hang out” together; we liked each other as friends, but we had different interests. However, because of that ONE little simple act of reaching out to me I had some amazing years of high school–the effects of which continue to this day. I have thanked him a couple of times, but he never really felt like what he did deserved any thanks. Sure it was simple, but it has had simply amazing results in my life. We ARE our “brother’s keeper”! Out of love, a 13-year-old boy in Arizona pushed himself to the limit so that his friend, who has cerebral palsy, could participate with him in a triathlon. A depiction of the Savior’s parable of the good Samaritan, in which a man is robbed and beaten by thieves, and a Samaritan shows mercy on him. Finding strength beyond my own. Lord, I would follow thee. Sorrow that the eye can’t see. Who am I to judge another? I would learn the healer’s art. I would show a gentle heart. For thy servant I would be. 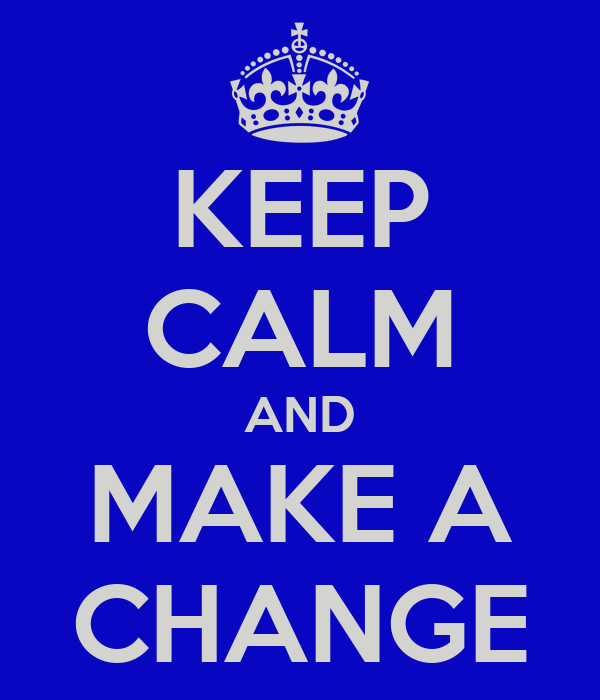 “The purpose of the gospel is to transform common creatures into celestial citizens, and that requires change” (“Repentance and Change,” Ensign, Nov. 2003). As recorded in Alma 19–20, King Lamoni experienced a change of heart, leading to the conversion of his wife and many of his people. Ammon and King Lamoni then traveled to the land of Middoni to deliver Ammon’s imprisoned brethren. On the way, they encountered Lamoni’s father, who was king over all the Lamanites. The king was astonished by the words of Lamoni and Ammon, by Ammon’s strength, and by Ammon’s love for Lamoni. 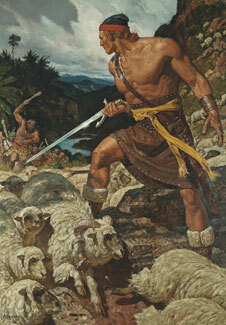 His heart was softened, and he assured them that Ammon’s brethren would be released from prison. He expressed a desire to learn about the words he had heard from his son and Ammon. Because of Ammon’s testimony and example, many people felt the influence of the Holy Ghost and were taught the gospel and converted. 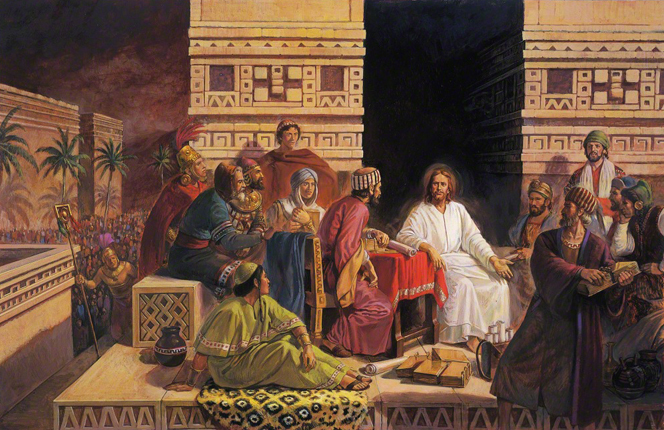 Aaron, one of Ammon’s brothers, attempted to teach the Amalekites and Amulonites about Jesus Christ and the Atonement, but the people rejected him. Then he preached in Middoni, where he and some of his companions were eventually imprisoned. They remained faithful during their time of adversity, and they continued their mission to share the gospel after Ammon and King Lamoni secured their release. After Lamoni’s father was prepared through the example of Ammon, he learned from Aaron about how to be “born of God” (Alma 22:15). The king learned that by repenting of his sins, he could come to know God and eventually receive eternal life. The faithfulness of Aaron and his brethren helped many Lamanites come to know God and His way of redemption. It has been my experience that the more I UNDERSTAND the gospel, the greater VALUE I place upon it. Use the “Degrees of Discipleship” scripture-chain listed below as an illustration of this principle of change and conversion. 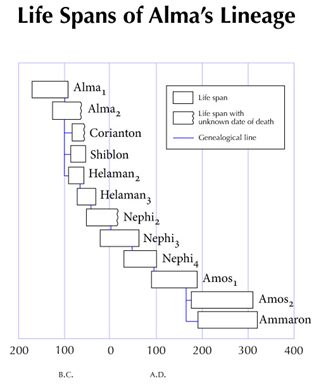 4th Degree: Alma 20:9-10, 13, 16, 19, What words show the value that Lamoni’s father placed on Ammon and the gospel? CHANGE: Alma 20:20, Because the Lord loves us, He gives us “humbling experiences” to help us change. We must learn to rely on the Arm of the Lord and not on the arm of the flesh. 3rd Degree Disciple: Alma 20:23, Oddly enough Lamoni’s father values his kingdom even more than his life at this point. What does a dead king do with half a kingdom anyway? 2nd Degree Disciple: Alma 22:15, As a result of Aaron’s teaching Lamoni’s father was willing to give up his kingdom for God’s Kingdom. CHANGE: Alma 22:16-17, “Hope is a memory of the future.” Feelings of faith and hope compel us to approach the throne of grace in our utmost humility. 1st Degree Disciple: Alma 22:18, Eventually, our great desire for the “future” that God has promised the faithful becomes so great that we are not only willing to give up “the world”, but we are willing to give up “ourselves”. “Let us here observe, that a religion that does not require the sacrifice of all things never has power sufficient to produce the faith necessary unto life and salvation; for, from the first existence of man, the faith necessary unto the enjoyment of life and salvation never could be obtained without the sacrifice of all earthly things. It was through this sacrifice, and this only, that God has ordained that men should enjoy eternal life; and it is through the medium of the sacrifice of all earthly things that men do actually know that they are doing the things that are well pleasing in the sight of God. When a man has offered in sacrifice all that he has for the truth’s sake, not even withholding his life, and believing before God that he has been called to make this sacrifice because he seeks to do his will, he does know, most assuredly, that God does and will accept his sacrifice and offering, and that he has not, nor will not seek his face in vain. Under these circumstances, then, he can obtain the faith necessary for him to lay hold on eternal life” (Lectures on Faith , 69. Emphasis added.). Just as a garbage dump can be turned into a beautiful park, a life of sin can be cleansed and changed through the Atonement of Jesus Christ. Apostles of Jesus Christ testify of the Savior’s power to heal, change, and purify us through His Atonement. This is a member-made non-official Mormon Message. Try filling in the blanks in the following quote using the words “MEMBER” and “MISSIONARY” (I listed the words in alphabetical order so that you won’t try and do that “Princess Bride” thing where the guy tries to figure out which cup has the poison… No cheaters!). What do I mean by, “do the math”? Well, what I mean is, with roughly 70,000 missionaries serving currently and a world population of 7 Billion +, each missionary would have responsibility for sharing the gospel with ~100,000 people. Not very good odds. Now if we use the same world population and use the members of the church (7,000,000,000/16,000,000) we get a ratio of ~438 people for each member of the church to influence. Now those odds are much better! Especially when you take social media into account. “Sharing the good news of the gospel is easier and the effects more far-reaching than ever before. . . . Perhaps the Lord’s encouragement to ‘open [your] mouths’ might today include ‘use your hands’ to blog and text message the gospel to all the world!” . . . When Junior, a young man in a small Florida branch, decided he didn’t want to be alone in his belief in Christ, he invited a friend. One friend joined, then another, and another…. Now, why on earth would Elder Holland say something like that when it seems to contradict what has been taught previously and is emphasized currently with the Hasten the Work initiative? We know what it means to be a MEMBER MISSIONARY. “Member missionary” sounds great (and the challenge has been extended frequently and recently by prophets of God), but one of the primary problems is the psychology behind the phraseology. 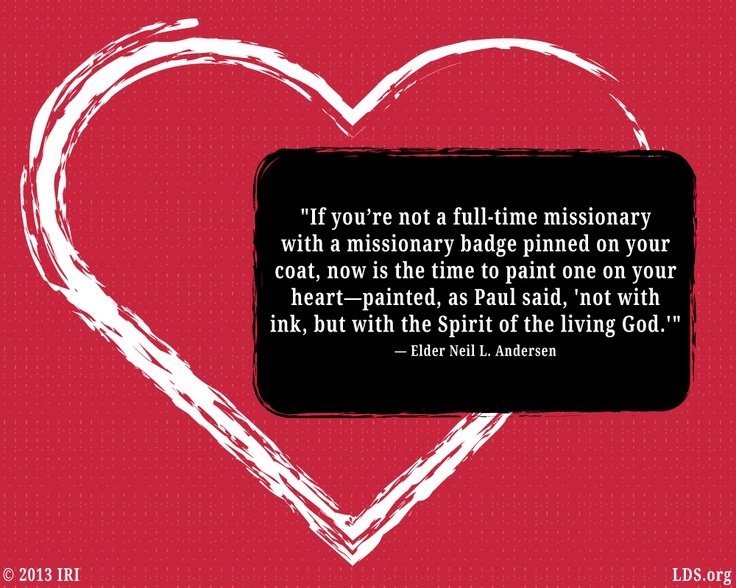 There is a lot of “baggage” and responsibility that comes with the word “missionary”. This can be very intimidating for members–especially those who may have never served a full-time mission. But if we ask every member to be a MEMBER, well, that doesn’t sound hard at all–no extra baggage, no added responsibility–we are just asking a member to do what they should already be doing. So, what does it mean to be a MEMBER MEMBER. Well, Elder Holland said that one way we do it is by simply “living the gospel.” Perhaps one of the best places to look for information on how to be a MEMBER MEMBER that is “living the gospel” is to study Mosiah 18:7-11. Think about it, isn’t that exactly what Ammon did? He didn’t start out in typical “missionary mode”. What did he do? He did exactly what any member of the church could and should do. He wasn’t able to be a MISSIONARY until he fulfilled his responsibility as a MEMBER first. All of this is why I refer to Alma 17-19 as the M.T.C. Not because it stands for Missionary Training Center in this case, but rather MEMBER TRAINING CHAPTERS. Ammon is the perfect model for how a good MEMBER MEMBER can make all the difference in the world by just “LIVING THE GOSPEL.” As you read Alma 19 you will be able to see the Ripple Effect of ONE MEMBER MEMBER easily affecting hundreds of other people. You can do that, right? 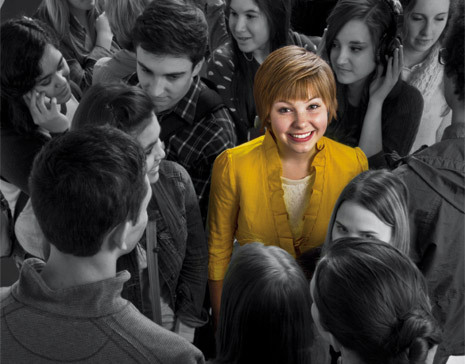 You can be a “lively member” of the church (see D&C 92:2) each and every day. You can influence the lives of many more than 467 people in a short matter of time by just living up to the covenants you made at baptism. You don’t need a badge on your shirt because you already wear His name on your heart! Think of what Ammon did in Alma 17-19, then liken it to your own station in life, and GO BE A MEMBER MEMBER! A priest finds out his friend has been hospitalized with cancer. His testimony and Christlike example lead her to a knowledge of the truth. 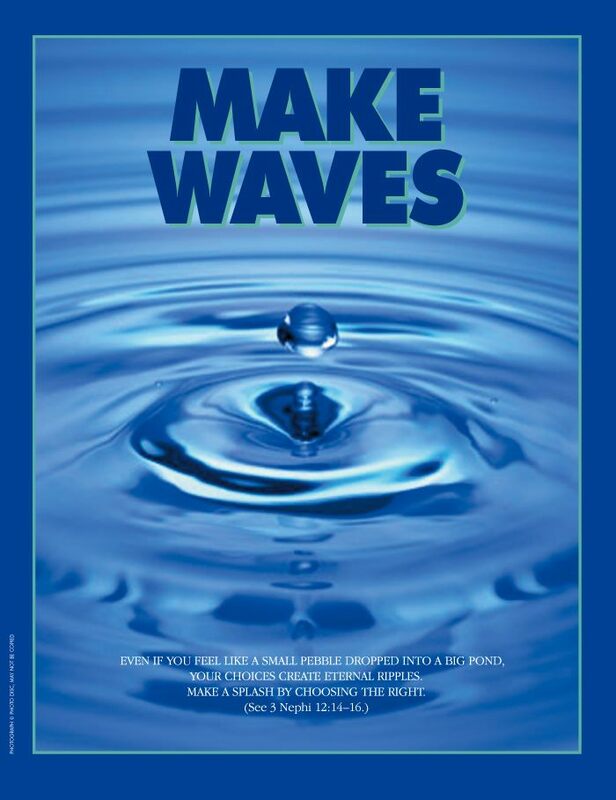 #BOMTC Mosiah 18-21: Count the Ripples! It is difficult to determine the effect that one person can have, but with time the results can be seen. You may never know how the decisions you make will affect others. Abinadi may have died without knowing if anyone believed his teachings, but Alma was converted because of Abinadi’s efforts, and he and his descendants had a great influence on the Nephites for many generations. The story of Abinadi (see Mosiah 11–18) is an example of how doing what’s right, even when it’s hard, can affect many lives for good. When Abinadi chose to be the one, his choice led Alma to be the one as well—the only one of King Noah’s priests to accept the gospel, which influenced an entire nation. 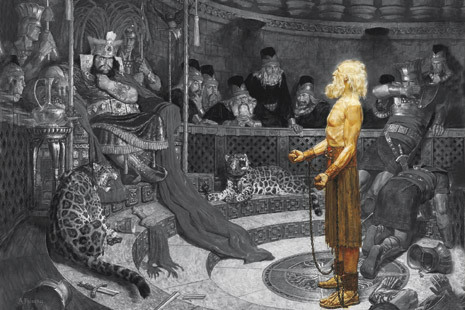 Abinadi: Abinadi’s testimony to wicked King Noah cost him his life (see Mosiah 17:20), but changed the life of one of the king’s priests, Alma the Elder (see Mosiah 18:1), who at the time was “a young man” (Mosiah 17:2). 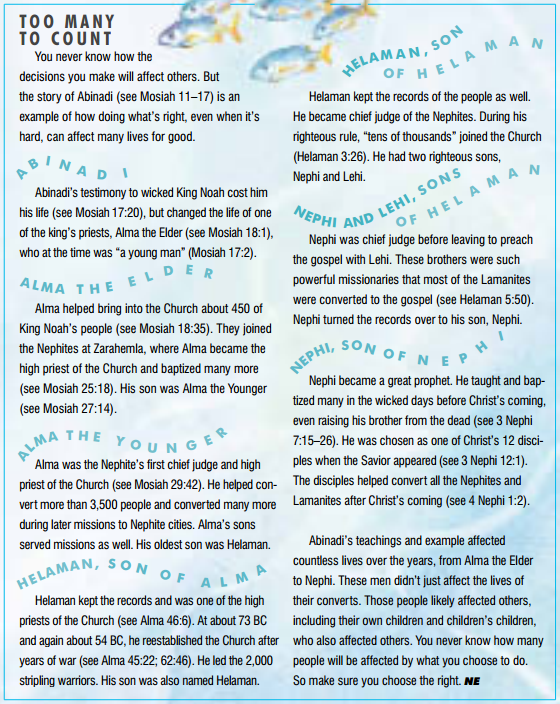 Alma the Elder: Alma helped bring into the Church about 450 of King Noah’s people (see Mosiah 18:35). They joined the Nephites at Zarahemla, where Alma became the high priest of the Church and baptized many more (see Mosiah 25:18). His son was Alma the Younger (see Mosiah 27:14). 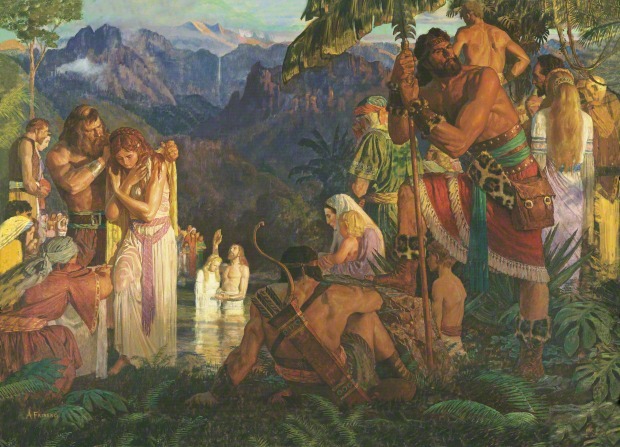 Alma the Younger: Alma was the Nephites’ first chief judge and high priest of the Church (see Mosiah 29:42). He helped convert more than 3,500 people and converted many more during later missions to Nephite cities. Alma’s sons served missions as well. His oldest son was Helaman. Helaman, Son of Alma: Helaman kept the records and was one of the high priests of the Church (see Alma 46:6). At about 73 B.C. and again about 54 B.C., he reestablished the Church after years of war (see Alma 45:22; Alma 62:46). He led the 2,000 stripling warriors. His son was also named Helaman. Helaman, Son of Helaman: Helaman kept the records of the people as well. He became chief judge of the Nephites. During his righteous rule, “tens of thousands” joined the Church (Hel. 3:26). He had two righteous sons, Nephi and Lehi. 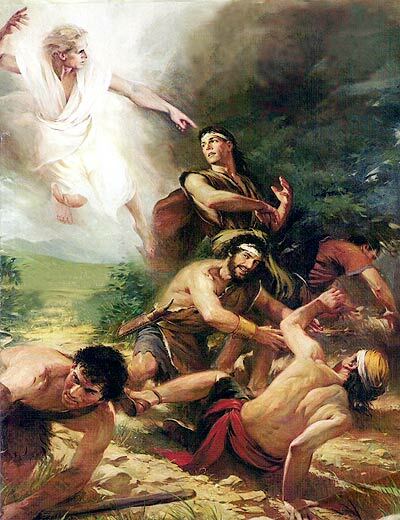 Nephi and Lehi, Sons of Helaman: Nephi was chief judge before leaving to preach the gospel with Lehi. These brothers were such powerful missionaries that most of the Lamanites were converted to the gospel (see Hel. 5:50). Nephi turned the records over to his son, Nephi. Nephi, Son of Nephi: Nephi became a great prophet. He taught and baptized many in the wicked days before Christ’s coming, even raising his brother from the dead (see 3 Ne. 7:15–26). He was chosen as one of Christ’s 12 disciples when the Savior appeared (see 3 Ne. 12:1). 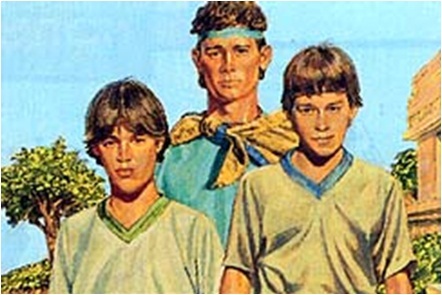 The disciples helped convert all the Nephites and Lamanites after Christ’s coming (see 4 Ne. 1:2). 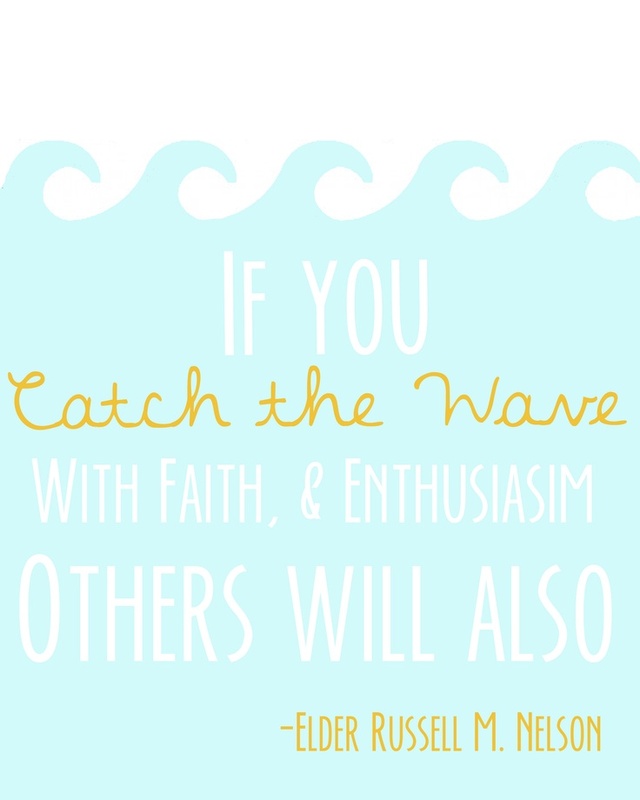 What kind of waves will you make? One of the talks that has had an everlasting impression on me is one given in a Saturday evening session of a stake conference years ago. The talk was given by a young mother. Here’s what she said: “I have been doing the genealogy of my great-grandfather. He and his large family of sons and daughters were members of the Church. The answer is apparent. The spiritual influence that family might have had on their neighbors and friends did not happen. None of his sons nor any of his daughters served as missionaries, and those they would have touched with their testimonies were not baptized, and those who were not baptized did not go on missions. Yes, there are probably many thousands who are not in the Church today, and not in this very meeting, because of that great-grandfather’s decision. Well, that opportunity of the past is lost. But we can now look to the present and to the future. I would say to those who find themselves in the same position as that great-grandfather: Would you consider what you might be doing to your family and to all those who come after you? Would you ponder the effects of your thoughts and your actions? … I would like to tell you of a stake conference I was assigned to attend. It was a reorganization; the stake president and his counselors would be released, and a new presidency would be called. The stake president was young and had served wonderfully for almost 10 years. He was a spiritual giant, but he was also an administrative giant. In my personal interview with him, he told me how he had delegated much of the responsibility for the stake functions to his counselors and to the high council and had thus freed himself to interview those who needed encouragement. Individuals and couples were invited to come to his office. There he got to know them, counseled with them, and invited them to do better, to put their lives in order, and to receive the blessings available to those who follow the Lord. He helped them by putting them in the care of a capable leader, a teacher who helped them to understand the beauties of the doctrine. Then he told me that in these interviews he would often ask if they would like a blessing. “I have placed my hands on the heads of many members of the stake,” he said. The next day in the general session of the stake conference, I doubt I have ever seen so many tears—not because they felt the president should not be released, but for the deep love of a young stake president who had blessed their lives. I felt prompted to ask, “How many of you have had the hands of the president on your heads?” I was amazed at the number of people who raised their hands. I thought to myself at the time, “How many of these people will bless the name of this great man, not only now but throughout the eternities?” Yes, these will be the great-grandfathers who will, because of this loving leader, leave a legacy of generations of thousands who will call him blessed. I served in the São Paulo Brazil Mission. While I was there, I met an elderly Japanese couple who served in various capacities in the mission. Brother and Sister Tsuya were well known for two things. First was the haircuts Brother Tsuya would give the missionaries. The other thing the Tsuyas were known for was their incredible love and mission spirit. They spoke no Portuguese and spoke English with a thick accent. But they would take a box of copies of the Book of Mormon they bought with their own money to the fruit fair on the street each week and would always come back empty-handed. Their spirit was incredibly powerful. One transfer day I had the chance to talk to Brother Tsuya. I found out that he had joined the Church in Hawaii. I told him that my grandfather had served a mission in Hawaii and was there during the attack on Pearl Harbor. Brother Tsuya was very surprised and said he had joined the Church then but didn’t remember an Elder Squire. I told him that it was my mom’s father, Elder Thurgood, who had served in Hawaii. Brother Tsuya almost fell out of his chair and yelled out “Elder Thurgood is your grandpa?” He related the story of their meeting. He said while he was eating a meal in the Hawaiian community style, he was being inappropriate and was taking the Lord’s name in vain among other things. A missionary, my grandfather, had spoken up and asked him to stop. Brother Tsuya said he took the name of the Lord in vain again. He said that my grandpa had come over to him, hit him on the shoulder, and lectured him about how little he knew about life, how he wasn’t as smart as he thought, how he needed to quit smoking and do a bunch of things differently or he wouldn’t ever amount to anything. Brother Tsuya told me that when he went home that night, he knew my grandpa was right. He thought about it and decided he wanted to make some changes. He ran into two similarly dressed missionaries a couple of weeks later and listened to the discussions with a sincere desire to change. Brother Tsuya gave much of the credit for his decision to listen to the missionaries to my grandpa. I asked him if he remembered hitting a smart-aleck Japanese kid at dinner in Hawaii and then lecturing him on how much he needed to change his life. He became instantly curious and said that he did remember the incident well. He was transferred away shortly after that and hadn’t heard more. I told him that two weeks later that boy had decided to listen to the discussions because of what you said to him that night. He had later married in the temple in Hawaii. He had served in various callings in the Church and blessed many, many lives. He served as a mission president in Japan for three years. He also served as president of the MTC in Japan. He had served multiple missions with his wife. My Grandpa Thurgood was in tears and couldn’t talk to me after that. He had spent over 50 years thinking his mission hadn’t made a difference to anybody. When the Tsuyas completed their mission in Brazil, my grandpa and his wife went to the temple with them and had a tearful reunion. My grandfather’s experience reminded me of Abinadi, my favorite Book of Mormon prophet. Abinadi had come before the wicked priests of King Noah and shared the gospel with great power and authority. He testified boldly and was burned to death because of what he taught. The only fruit he had the chance to see was one of the priests, whose name he may not have even known, who asked the king to let Abinadi go and then was chased out of the court. That priest (Alma the Elder) then became a great prophet himself. We never know the effect our testimony will have on those around us. How could my grandpa have known the difference his testimony at dinner would have on a young man? We learn that it is not ours to judge those around us when sharing the gospel. It is so easy to look at others and assume they are not interested in the gospel. We think the soil is rocky and that nothing would grow if we tried. Our responsibility is to cast seeds. We are called to share. We are called to invite. We are called to include. The gospel is a gospel of repentance, a gospel of change. In Christ is the power to change. Christ has the power to heal. There is nothing so exquisitely sweet as seeing a soul come unto Christ. You can print this up as an easy glue-in for future reference. Click here for original.